Hello everyone, due to recently Nintendo "warnings" to different sites, we've decided to eliminate the word "pokémon" from our fangame title, as a safety measure. Here we present you the new logo for "Fierce Melody". It looks absolutely stunning, from the spriteart to the fakemon design, it all looks awesome and falls into place really well. I'm really excited to eventually play a demo of this game. I wanted to try out the first Alpha-Version of that Game due to the cute art style and music-topic got me, but when launching the Game I get an error message that 'RGSS102J.dll couldn't be found' and the window closes itself. I've downloaded from the link provided in the first post of this thread, any idea what could be wrong? EDIT: Nevermind, daring to rename the RGSS102E.dll starts the Game, but maybe this could be fixed or adressed in some way. Finished with Alpha 1, and what I saw made me definitely look forward for more content. What positively caught my eye is 1. the smooth and accurate spritework, it makes everything look very decent and detailed - keep it up! and 2. the dynamic in battle, which probably comes from the Pokemon being animated and the Gen.5-styled tracking shot, I love that in the official games. I actually don't feel like the starting town (Whistle Town) is too large, it's having all that's needed and nothing actually feels 'unnecessary' in the map for me. Got a small spelling error to report though if allowed, when saving in that place it displays 'Whislte Town'. I'd edit the dialoge of Selah a little to be less laid-back, unless she's on purpose made the kind of person that talks rather casually with everyone. Which would be hilarious to see as the plot progresses for sure, lolz! I love your new title logo graphic; it looks so awesome! Hello everyone, in the little free time we've had, we've been working and analyzing the first part of the game. That's why there have been little updates lately. Did you changed the new burny? i hope you didnt it was my favorite starter and its means no nookibush or capiqua ? Or even typool ? We present you the final design of the Merodia Region starters, we hope you like them and we will continue working hard on the project. 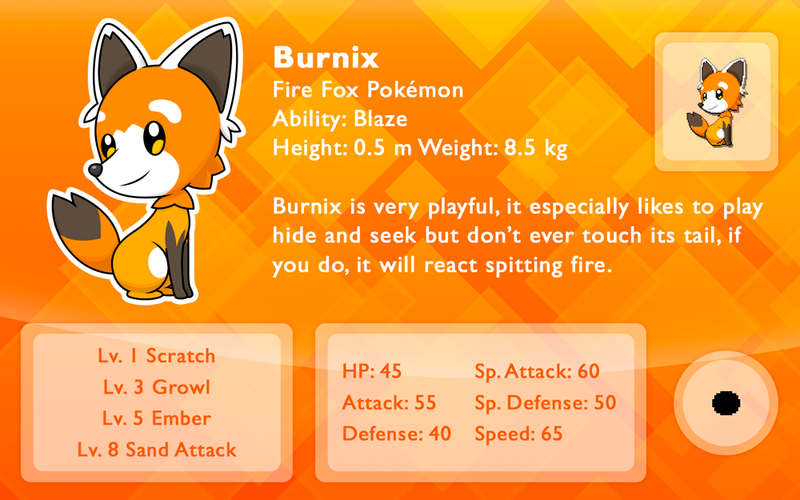 While I mourn Burny a bit for its adorable design and harlequin-like evolution, I'm absolutely in love with Burnix because I just like foxes so much! 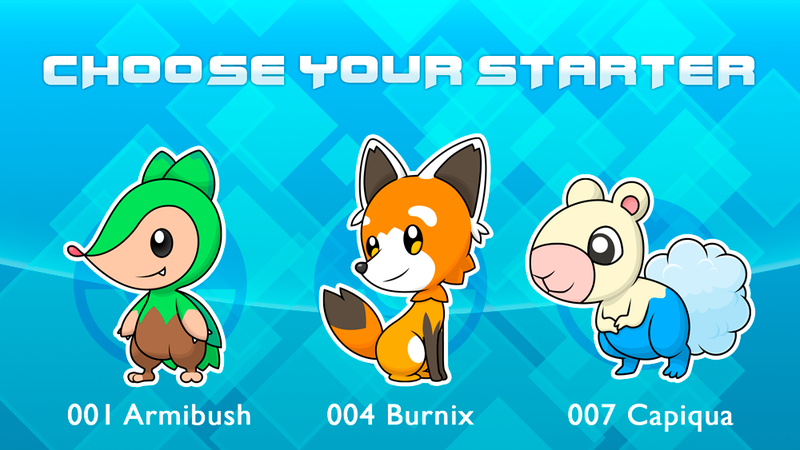 Do you plan to update the already existing demo to include these new starters if I may ask, or will that be changed in a future update? Thank you, they'll be in a future update but also we planned to update the already existing demo with these new pokemon. Looking really good so far with the new Starters implended! I'm somewhat in love with the graphic style of this project still, and the small potraits of the talking character are a neat addition. 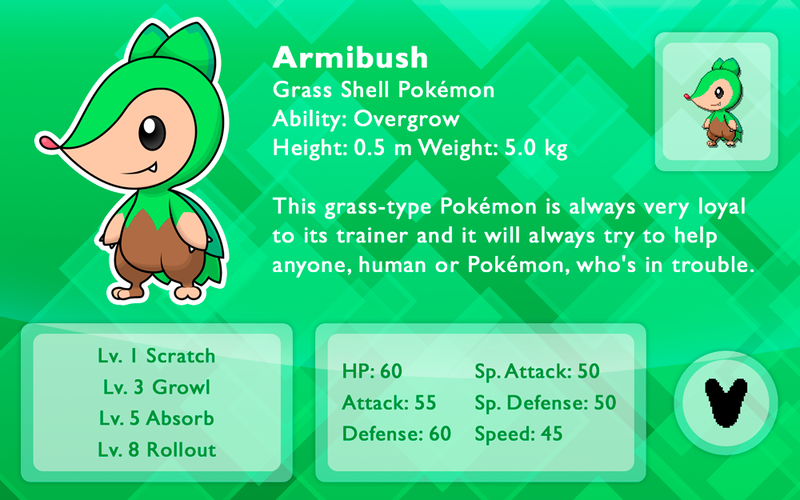 I'm having another question if I may ask, are there plans of custom cries for the used Fakemon or will cries of official Pokemon be used? I would appreciate the former but I'm aware it's extra work. Hi :D, even if it means more work, we'd love to create our own cries but we don't know how. Everything in this game has been made with the bases given by the RPG Maker, Pokémon Essentials plugin and EBS, adding our own images and designs, we actually don't know anything about scripts or that kind of things, we're learning as we progress. It is really fun though xP, and we are more than pleased with the feedback and support given. Note: We have noticed some dialogue mistakes :P, tell us what you think about it. So, I played it and have some feedback for you guys! You've already addressed some mistakes like the grammar but I noticed some other things that should easily be fixed with playtesting. My computer is garbage so it didn't run well, but whatever. Despite this the game was sped up (like the walking speed, mine and the characters' as well, and battles were very fast). It's fine. A lot was improved, but some things that I pointed previously were left unanswered which is a shame. However, I liked what I saw especially aesthetically and am excited to see what you can come up with as well as how you can grow upon the foundations you've built. If one was needed, 5/10. Don't panic, a 5 means it's not too bad but not so good either. Above all I see potential for a 7/10 at least, so do not be discouraged and keep up the good work! PS: I saw you were looking for these, I have some Fakémon I had made for dead projects and for fun that I can offer you if you want. Once I get them ready I'll send them to you for appreciation. Cheers!